Senior biochemistry majors Matt Morris, at left with faculty mentor Rick Page, and Krystina Hird, at right with faculty mentor Carole Dabney-Smith, received $19,300 Beckman Scholarships for 2018-2019. Senior biochemistry majors Krystina Hird and Matt Morris both chose to attend Miami in part because of the opportunity for undergraduate research. Now, as Beckman Scholars, they will receive $19,300 and continued support for a mentored research project over two summers and one academic year. Miami was one of 12 schools to receive the Arnold and Mabel Beckman Scholars Program Institutional Award for 2016-2019. The program allows Miami to offer the Beckman Scholarship for up to five students for three years. Hird, from San Antonio, Texas, is also a plant biology, molecular biology and bioinformatics triple minor. She is mentored by Carole Dabney-Smith, associate professor of chemistry and biochemistry. She is working on Dabney-Smith’s project on how proteins move across plant cell membranes. Using garden peas as a model, they are researching the assembly and mechanisms of protein transport. 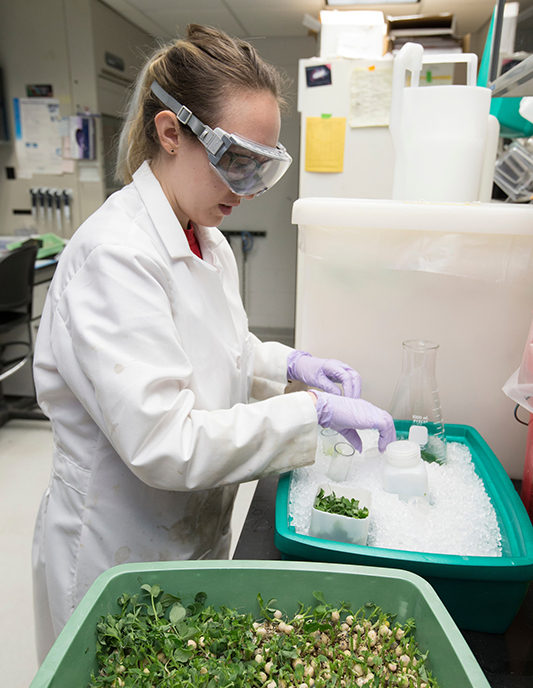 “My favorite thing about research is that for a short period of time, you can discover something that no one else in the world knows, and that feeling is really what motivates me through every difficult assay and every failed experiment,” Hird said. Hird is a plant biology, molecular biology and bioinformatics triple minor. When she started at Miami, Hird lived in the First Year Research Experience (FYRE) Living Learning Community, which helped her through the process of finding faculty research pages, how to approach a professor to ask for a position in their lab, and learn what the work would be like, Hird said. 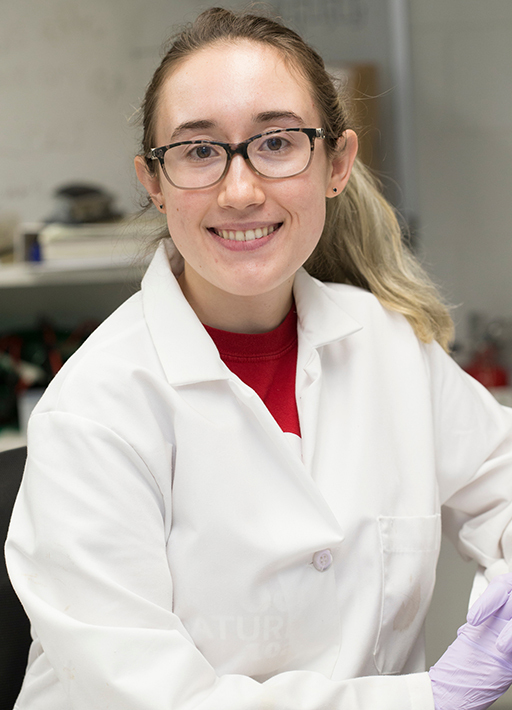 She joined Dabney-Smith's lab during her first semester. "Krystina is a talented scientist who has made significant contributions to the lab through her skills as an experimentalist and her ability to think creatively and analytically," Dabney-Smith said. Hird is also an LSAMP Scholar (Louis Stokes Alliance for Minority Participation program, funded by NSF) and is alumni secretary for the coed service fraternity, Alpha Phi Omega. She will present her research in a poster session at the American Chemical Society national meeting later this summer. After Miami, she plans to pursue a doctorate in a plant biochemistry-related field. Hird’s favorite class at Miami? Genetics. "The material was incredibly interesting, and I was learning fascinating new things in every class,” she said. Morris, from Anderson Township, is a double major in biochemistry and music performance. He is mentored by Rick Page, assistant professor of chemistry and biochemistry. He is working with Page on his research project on clinical inhibitors of metallo-beta-lactamases (MBLs), which render bacteria resistant to antibiotics. Like Hird, Morris wanted to be involved in undergraduate research as soon as he started at Miami. His older brother had done undergraduate research with David Tierney, Volwiler Distinguished Professor of chemistry. Within his first week at Miami, Morris decided he wanted to contact Dr. Page about the metallo-beta-lactamase project. Within a couple of days, he was getting trained in the lab and has been working in it ever since, Morris said. Morris is also a music performance major and president of the Miami men’s a capella group Soul2Soul (listen to them on YouTube). Outside of the lab, Morris is president of the Miami men’s a capella group Soul2Soul and is a member of the Miami University Collegiate Chorale. He works as a pianist, organist and occasional drummer locally and in Cincinnati. 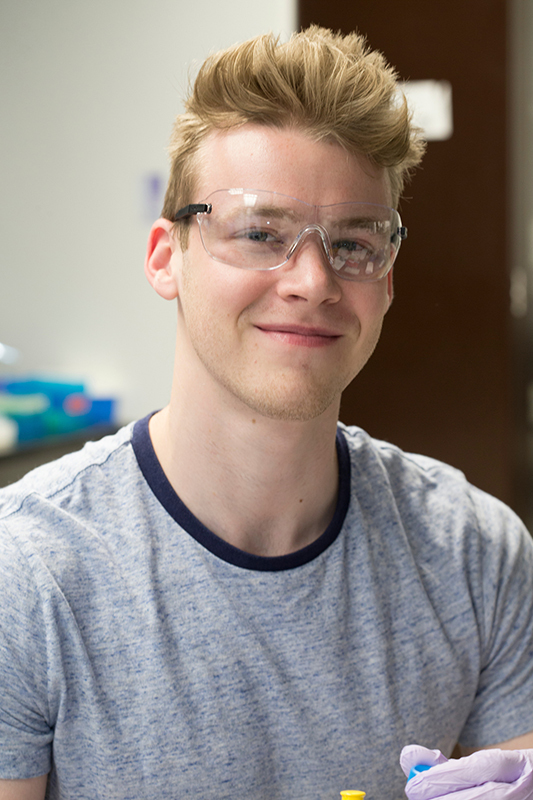 He was a 2017 Undergraduate Summer Scholar with Page and presented his research at the annual American Society for Biochemistry and Molecular Biology conference this past spring. After Miami, he hopes to enter medical school or an MD-Ph.D. program. Morris’ favorite class at Miami? Piano lessons with Frank Huang, assistant professor of music. “Those weekly lessons are a great escape from my other classes, and I can just focus on learning and enjoying the instrument,” he said. Miami is one of only a few schools to have won the Beckman Scholarship Program Institutional Award four times, according to Michael Crowder, chair and professor of chemistry and biochemistry. Institutions must be invited to apply for the award and demonstrate a significant commitment to undergraduate research in chemistry and the biological sciences. At Miami, students selected for the scholarship work with one of Miami’s Beckman Scholar mentors in the departments of biology, chemistry and biochemistry, or microbiology.